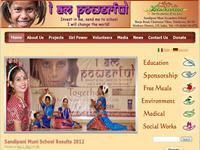 The official website of Food For Life Vrindavana, which is working for the Empowerment of the Girl Child. Alongwith education, it is also working for Social Development, Food Distribution for the poor people, Care for Cows, etc. Category Charitable Foundations May 5, 2012 by ISKCON Desire Tree.